MOV is an Apple QuickTime format and is commonly used by iPhone, iPad, iPod, iTunes, etc. However, if you're using Windows, you will find that playing and editing MOV files in Windows is a troublesome issue. 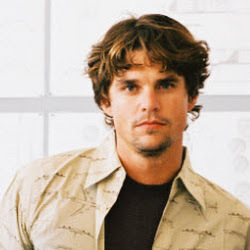 For instance, neither Windows Media Player nor Windows Movie Maker support QuickTime MOV format. In order to conveniently play and edit MOV videos in Windows, you will need to convert MOV to WMV, a Windows preferred file format. To convert QuickTime to MOV, a video conversion program is needed. Here you can just get the Ultimate Video Converter from Aimersoft to convert MOV files to WMV with superfast speed and high output video quality. Moreover, it provides much more than simple converting videos to meet all your needs. 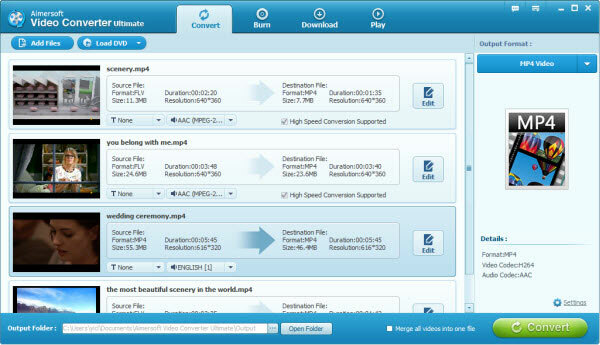 Now download the converter and have a look at the easy steps below to finish all the operations. Here the detailed steps to convert QuickTime to MOV in Windows (Windows 8) are described. The way to convert from MOV format to WMV on Mac is the same. Now you just need to make sure you have downloaded the right version. Install and run the QuickTime to WMV converter. 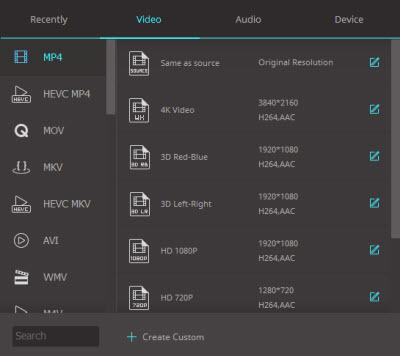 Then you can import your MOV videos from your computer's hard drive or portable devices in 2 ways: 1> click Add Files to browse and choose files to load. 2> Directly drag the MOV files to the program. The loaded videos will be displayed with the detailed info like Format, Size, Duration, etc. An Edit button is located at the end of each video item. 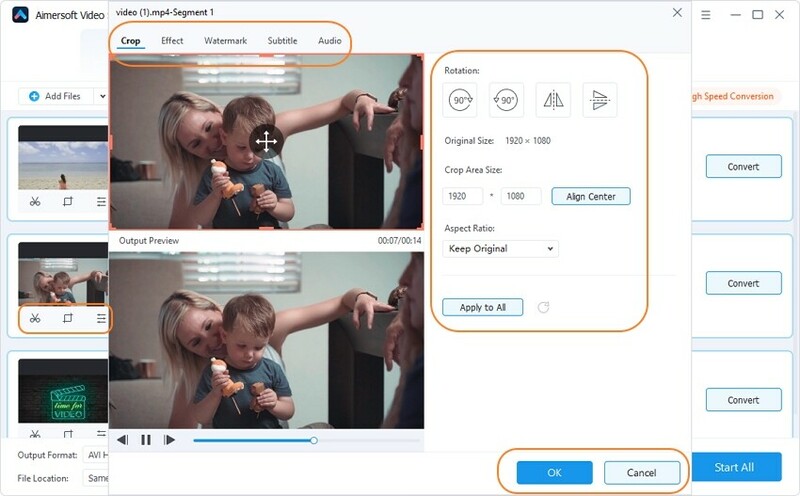 By clicking it, you can enter the video editing window to trim videos, crop videos, add watermarks, insert subtitles and more to customize your movies before the conversion. Next, click Output Format and choose WMV as the export file format. And click Output Folder to set a folder to save the output files. As you see, in addition to changing MOV to WMV, you can also use this conversion app to convert MOV to MPEG, MOV to MP4, MOV to FLV, MOV to MKV, etc. Once you're satisfied with all the settings, click the Convert button to start converting all the added MOV videos to WMV. When then conversion completes, click Open Folder to get the converted WMV video clips. And all has been done now. Just enjoy your movies. i can use Windows Media Player to play mov videos and as well i can edit mov videos with Windows Movie Maker 2012. I am confused now. Why i need to convert MOV to WMV?